CASA (Court Appointed Special Advocate) was founded in 1976 for abused and neglected children that are in our court system. I have been a CASA volunteer for 7 years. I attended training under director Frances Witt-McMahan (featured left with her daughter, Taylor) and was sworn in by Judge Watson. Assigned my first case, my role was to befriend the children involved so they knew that I was on their side and my efforts would be to help them navigate through the legal system. Over the years some children were so young that they did not even know that I was there while others were self-centered teenagers waiting to be reunited with their parents or family. A fund raiser to help needy children in our area is the Red Shoe Gala. We get to have a fun evening with our family and friends while helping children in our area. This year the CASA Red Shoe Gala was held on Sept. 19th at St. Mary’s Parish Life Center in Athens. Attendees had fun as we displayed our red shoes, enjoyed an auction, dinner, dancing and beautiful decorations provided by Events with Ambiance. Vice-President Pam Wilson served untiringly as chairman of this event for McMinn, Meigs and Rhea counties. I am sure that I remember my first case more distinctly since I was scared that I might make a mistake and not end up helping the children involved. When CASA received the case the girl was 14 and her younger brother was 13. The father was in prison and so was the mother, and the children were going to age out in Foster care unless they were adopted. When the family was first split up they were 9 and 8 years old. There were 5 children and family members, an older sister had taken the two younger children and a Great-Aunt had taken the oldest child, but the two middle ones were left in the State’s care. They were put into a group home for a year then placed with a couple who said that they wanted to adopt them. But after eighteen months the would-be adoptive couple was charged with drugs and contributing to the delinquency of a minor. A quick scramble put them back into the group home and then they were placed in a devout Christian Foster home. These children are a testimony to how well children can adapt to whatever situation they are put into. Now the parents are required to sign away their legal rights to their children so that the adoption process can begin. The DCS (Department of Children Services) case worker had worked hard with every family member that they could find before finally setting this process into action. This was my first case and I was already shocked at the thought that “these are just two of the children who have found themselves in a hard situation through no fault of their own”. When I met the children they were good looking teenagers who were still being successful in school. The boy liked to fish and watch cartoons and the girl was thinking about make-up, her pimples and maybe college. They had given up on being reconciled with their family though this is the one thing they wanted. Maybe it something in our genes but children always want to be with their family no matter how bad the situation. I visited them in the new Foster home, also the school they were attending and talked with family members. Then the magic came, the one constant that they had in their life was a grandfather. Not a blood grandfather but a step-grandpa. He had known them since birth and loved them, and was always sad that the courts would not grant him custody since he was not blood kin. In almost every case I see when the Judge makes a decision I say a silent “Thank-you” prayer for grandparents. They step-up and take the young or the older grandchild. Sometimes they even testify against their own children trying to do what is best for the next generation. Grandparents are the silver lining in the dark cloud and give love, time and treasure to protect their grandchildren. Thank you grandparents. Each Christmas we sing about the beautiful star of Bethlehem that shines in the eastern sky. We often find ourselves looking in the heavens for that star. Here in Athens, we might not find the star of Bethlehem when we look up toward the east, but we will see something shining bright overlooking our town during the Christmas season. 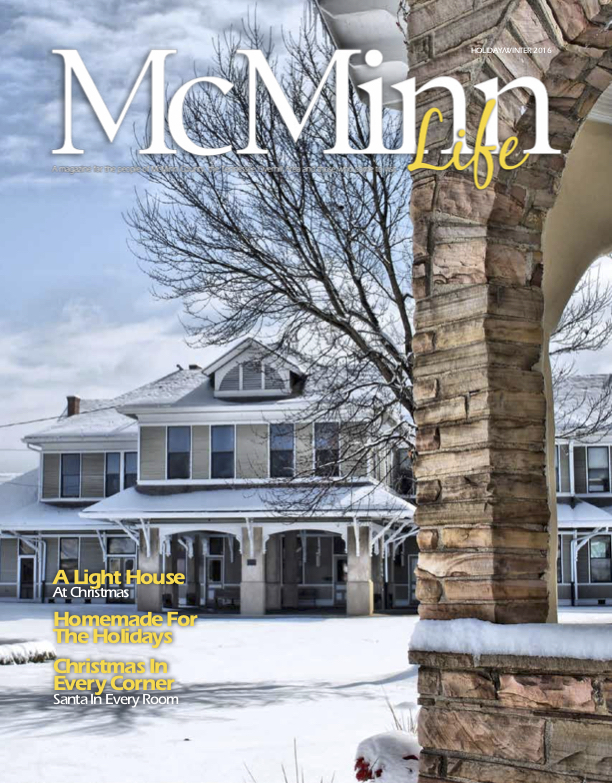 Up on a hill overlooking downtown is a white gingerbread house, with a turret, outlined in clear twinkling lights. Its owner, Lonzo Lamb decorates it to help ring in the holiday season for the Friendly City. This December will make nine years that Lamb has been decorating his house on the hill overlooking the downtown. However, he started decorating his home for Christmas in 1954 when he and his wife Johnnie lived on Slack Road in Athens. “I do it for my own pleasure, but people really enjoy that I decorate the house.” He says he’s had visitors and people have written him letters thanking him. Lamb has two brothers, Jerry Lamb and Lester Lamb, who help him put the lights up each year. 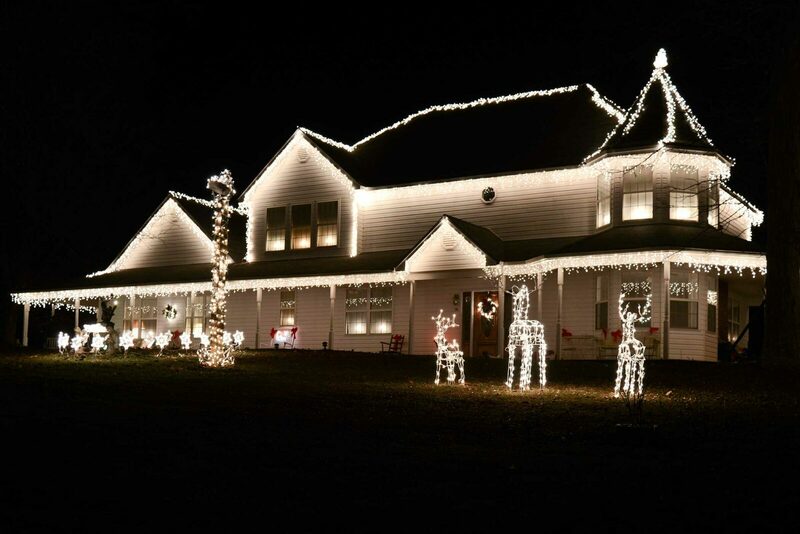 Lamb says it takes about seven to eight days to check all the lights, make sure the circuits are properly working, and check all the ladders and scaffolding, in addition to decorating his yard and placing the lights on the roof. He has seven different power supply locations as not to overload the circuits. He also has the lights plugged into a timer that is set to come on at 6 p.m. and turn off at midnight. “We start decorating in November. We turn on the lights at Thanksgiving and turn them off the day after New Year’s Day,” he says. Together, they put about 5,000 twinkling white lights on the outline of his roof each fall. He always puts out a “Kiddy Corner” with deer, a little train, bears, and Christmas trees. If you include all the decorations in the yard, Lamb says it adds up to about 22,000 twinkling lights. He uses clear icicles for the roof outline, and likes the look so well, he uses clear lights for everything. He says they show up really well.